The workers in the municipality sector were demanding a decent wages increase of roundabout 15% and the capitalist ANC/SACP government has been offering the workers a meagre 4.4% increase for a multi year period plus 1% CPI , Consumer Price Index. Accordingly, these meagre wages increases would mean the workers will not keep up with the escalation in the price of food , electricity and transport cost. Currently in the public sector the treacherous leadership accepted a 7% increase and that is the demand of the imperialist IMF (International Monetary Fund) and World Bank (WB) to cut workers’ wages and for the capitalist government of ANC/SACP to divert more funds to the pockets of imperialism. Subsequently, the workers’ demands were dropped by the treacherous leadership of SAMWU and they agree on a similar wage agreement as the public sector and that is a 7% increase , plus 1% and CPI in the next 2 years and that is without the mandate of the workers, who still demand 15%. There was no consultation with the workers ; they have to find out by hearsay from their fellow workers, some were confused and found out on certain radio stations, or see it by accident on emails. The treacherous leadership did in everything in their power to prevent workers democracy. Even the press conference was postponed. They were afraid it will influence the workers in other industrial sectors to demand better wages increases not the crumbs of the IMF and World Bank. Now the ANC within the Samwu leadership have expelled the critical voices within the union. These officials have started to form another union : DEMAWUSA. The left has been expelled to strengthen the ANC/SACP apparatus within SAMWU, and workers are caught between a rock and a hard place because there are now 3 unions in the municipality sector. This has split the workers further and has created space for the bosses to exploit the workers even more. The problem is that these officials who started a new union did not yet mobilise the workers to fight the capitalism system which is the root causes of corruption and they focus only on the missing funds that disappeared from Samwu. Focusing on the loss of workers’ hard-earned money did not organise the workers, instead it has kept the workers at bay by waiting for an auditor to investigate the missing funds. Recently SAMWU had their 15th National Congress and the theme was : ’ FIGHTING FOR DECENT JOBS, WAGES, AND ACCESSIBLE SERVICE’. This is contrary to the reality of what is happening on the ground. There is a massive onslaught of services being cut , outsourcing , privatization and work being given to labour brokers . Those who work for EPWP (Expanded Public Works Programme) get meagre wages and no benefits. Work is under difficult and harsh conditions, with no proper protective clothing. Currently the permanent workers do not get a decent living wage, exactly the opposite, we get a meagre increase that ties the workers for three years. All this is a scheme of the imperialist IMF agenda to make super profits by have services collapse or put under their control. 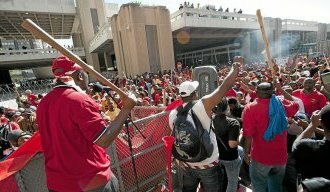 The workers must demand immediately a special national congress and invite all the workers in our sector, irrespective which union who belongs to and even if they are not affiliates of Cosatu or Saftu. There, we must reject the 3 year agreement .Stop the poaching members of SAMWU or any union .Invite the outsourced workers, labour broker workers and workers in the private sector. Having different sectors is a mechanism of imperialism to divide the workers. Workers must demand insourcing , stop labour brokers , stop privatization of municipal services. Especially now that the victory of Numsa against labour broking gives the working class a further grip to fight privatization. Put the auditors under workers control , and demand free basic and tertiary education , free transport for students to study in any school in any area- in this way we can break down of the artificial barriers that exist. We can clearly see the leadership of SAMWU and other emerging unions fragment and split the workers and the result is that we remain subordinated to the ANC/SACP CAPITALIST GOVERNMENT. Therefore it is important to start to organise and form joint workers committees at each workplaces and in communities, irrespective of union or party affiliation. Forward to an independent, revolutionary workers party. Build the SRWP.